Law enforcement officials across the US have been left baffled by a crime wave targeting an unlikely item -- Tide laundry detergent. Theft of Tide detergent has become so rampant that some cities are setting up special task forces to stop it and retailers like CVS are taking special security precautions to lock down the liquid. This is a bit nuts. Stealing laundry detergent for resale. Most stores/pharmacies have to put the rubbing alcohol and other products behind the pharmacy area, now they are stealing laundry detergent. What is the world coming to? Honestly Cubed, when I bought a liquid container of Tide, for washing my clothing I DID NOT REALIZE I was next to committing a crime of the shop haneling it were criminals as well. Realize things tend to send a human wondering. Last evening Cdn news is that some chap well into his 60s or a bit later, was driving his car to be stopped by an RCMP Constable & given a ticket for using a cellular phone while driving in Winnipeg Manitoba. That along with the final fine is enough for him & his wife to go after the RCMP to also the media of where he does not have a cellular phone & THEIR only phone is one hanging on the wall. I hope he wins for some day I might receive the same. Also so often around holiday time I am stopped by the RCMP, but not the last few years, asking if I was drinking ONLY to say "I have never touched any form of liquor in my life" So guess I was lucky to not receive a ticket for driving while drunk of what-ever. True I had a bulky moto-rolo sort of temelphone that I had planted in my truck. I, so on the way home I woud be standing outside of the truck telling my mother I would be home in a few minutes & asking if she wanted something that usually turned out to be some milk. True on a few occasions I would ask how she felt & if okay I was going to be at the Gun Club for anothee 30 minutes & was given the okay, but the above was done to the Moto-rolo was plugged into the thing for making a cigarette light up, but then most of you know I never touched tobacco even from my birth year of 1930. 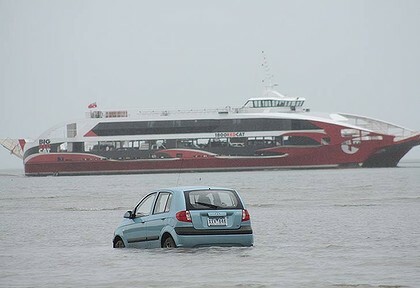 Three Japanese tourists came unstuck on their planned Australian holiday on Thursday when they abandoned their hire car in Moreton Bay after they tried to "drive" to North Stradbroke Island. The low tide and a GPS navigation system lured them into the bay at Oyster Point at Cleveland. A firm gravel surface quickly gave way to the renowned bay mangrove mud and the Hyundai Getz was soon up to its axles, but not before they managed to travel about 500 metres. Some agree that the GBS if properly used is worth the money. A friend 20 miles south of me was on the phone & lost for his GBS was usless in this town to him. Still going back to the lst one of the chap being given a ticket for Cellular, but it could have been anything. After all look at a twitter that is an electric device & some city buses had driven into other traffic as the driver was to busy on the twitter. How I wish I could copy a video on one of the m/c boards. This was a maze of Russians in a main area when some trained dancers were ready for the start. As one chap comes along with a loud seaking mobile unit, turns it on loud. Then so many started to dance, to singing in Russian, to others taking photos & all seemed to be in such a happy mood. Enough to have my eyes with tears in them. Some other sections I could dial in & one was like a militay group for all in the same gear & such a mass of others moving in to be stepping the same way with arms swinging or not, to where it was amazing that with over 100 of them they did not run into each other. I might copy the above, but if I tried to offer it to you or anyone else it simply did not work. Yes another mass of young people doing the same in a large mall as well. All of this showing exactly what Jackson had in mind wih dancing along with music. No I did not accept Jackson as a fool that wanted to look more like a white-man only to look more like a monkey. Still the Russians must have carried on & it was more then Jackson could have dreamed about. Regarding the bit of dancing of a maze of Russians, to them also singing. One chap on an American m/c board stated he was close to where the lst one was the attraction. His mother insisted he take up dancing & yes it was in ballet, but some yrs later his father called it quits. Though he said most Russians loved to sing & dance---so little wonder it went so well in Russian places. Mind you in 1936 I was sent down the street to where a sister & brother (old enough to join the Navy come WWII in 1938) to teach me some steps. When home my Mother asked me to show her what I learned. In turn she showed my some of the Jazz steps in 1926-28 as crazy at it may of seemed it was about Jazz. So I found out that my Mother along with a few other gals were at booze parties & she liked dancing to also singing for if there was a piano in that home he friend would take over the crowd due to the piano to singing. Obviously my past Mother must have liked PARTIES & wonder how I turned out liking classical music or Jazz from my Mother pacticing or normally singing while my father would play his Baby Grand Piano. More so not one to smoke, touch liquor or illegal drugs!!!! Not funny, but some idiot of a m/c rider on a Yamaha R-1 sportbike rode down the main hwy in Vancouver Island at the pace of 300KPH, passing cages close by, to passing on the wrong center-lane & such. The video work was then sold to some firm like FB. Finally the RCMP have the bike & gave the media a lot of information. Now if you give the media a lot of information or even a little they will screw it up in GRAND STYLE. All we know is the the last name is Scott around 27 years if age & had praised the idea of dramatic speeding. Darn fool did not take a stab at REAL road racing for then that is 100% different & only for the experience riders, pit crews & such can manage it a bit. We are left baffled for the m/c is registered in his Mother's name SO the RCMP have handed out a number of fines to the Mother to the son as well, but he was not avaliable. These were not charges of a light order. Some hindered on WHO???? was riding the bike, the fact that the son has been nailed a number of times for speeding & lost his DL a number of times. Also charges to the Mother because the bike has no Compulsory Issurance as the rest of us car or m/c must obtain when renewing the LP. This one leaves us baffled only to know the lovely bike will be in the RCMP coumpound for some time & the son, mother(if she can ride), friend cannot ride the bike. Best the mother can do is ASK a m/c shop to sell the bike & the bit of money from the sale will be some money for all the costly fines she has received. Some news does not put a smile on my face, but the couple up in Alaska noticed this soccar ball in the sea right by where they were walking. In picking it up there was probably the lst name of someone in Japan, on it. So the struggle was to find out WHO. Yes the gentleman in Japan recognized it as being his. So it is on its way to Japan & his home. No one knows who created this word map of Canada, but it is funny. As the article states, who ever created it missed a few items, but still a good job of putting it together.